Scientists Say The Moon Is Hiding A Lumpy Middle : The Two-Way It turns out that our nearest neighbor in space is sort of a squashed sphere. The lead author of a new paper published in Nature describes it as "a lemon with an equatorial bulge." 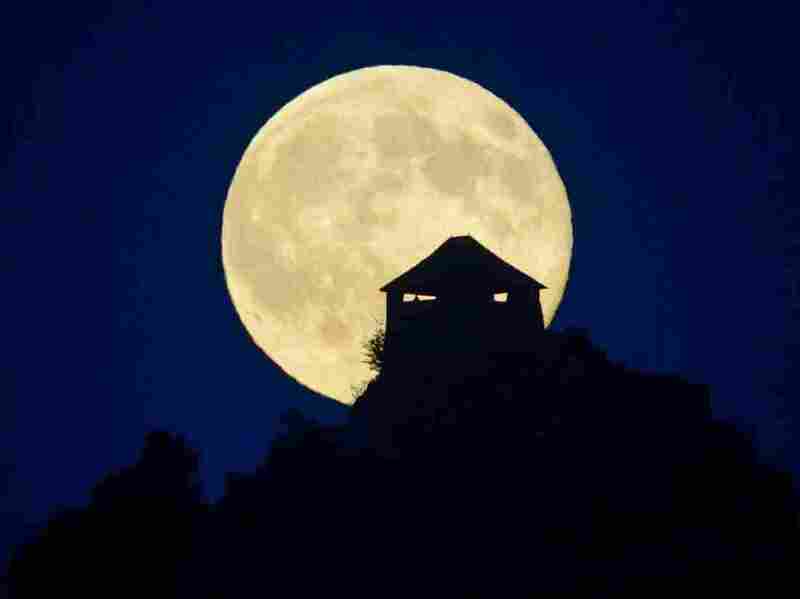 The full moon rises above the castle of Somoskoujfalu, northeast of Budapest, Hungary, earlier this month. What shape is the moon? When it's full, we'd all agree that it looks perfectly round. But careful measurements by a team of scientists have shown that's not the case. Like many an Earth-bound observer, it turns out that our nearest neighbor in space is hiding a slight bulge around the waist. It's less like a ball and more like a squashed sphere, with a lump on one side. That's according to Ian Garrick-Bethell, a planetary scientist at the University of California, Santa Cruz, who is the lead author of the newly published findings in Nature. "If you can imagine a water balloon flattening out as you spin it," Garrick-Bethell says, describing the slight "lemon shape" of the moon. How did it get that way? It all goes back to a time when the moon was formed after a collision between a very young Earth and an ancient body known as Theia. The crust solidified, but the moon's center was still largely molten. According to The New York Times: "Efforts to pinpoint the moon's exact shape have long been stymied by the presence of large craters on its surface that formed after the crust solidified. There have also been inconsistencies between its measurements and what we know about its past." "To overcome the crater problem, [Garrick-Bethell] and his colleagues used highly accurate maps of the moon's topography, made with a laser altimeter, then ran calculations to see what the surface could have looked like before the craters formed. "The measurements that emerged help explain how the moon acquired its shape, the researchers say. Its squashed appearance is probably a result of the gravitational process called tidal heating or acceleration, which stretched the moon's crust as it was being formed. The equatorial bulge probably dates to a later period, when the moon was still spinning but was slowing down and moving away from earth, freezing a tidal surge in place." The BBC says Garrick-Bethell and his team were inspired by similar research in a 2013 study by researchers from the University of Texas at Austin. They calculated how tidal heating caused by Jupiter's massive tug was causing warmer water under the ice crust on Europa.